Does your business taste like chicken? Do you tell crap jokes and pay for laughs? Does anyone care about what you do? Originally published in 2002, Purple Cow analyses outdated twentieth century broadcast advertising in the new business paradigm we are all experiencing. As the information age continues to throttle the old ways, the author urges us to reconsider our approach to creating, designing or selling. Mass marketing is out, design and innovation is in. Seth Godin is an established post industrialist thought leader, public speaker, contributor to TED talks and author of dozens of titles including Poke the Box. In 1998 he was the president of direct marketing at Yahoo and set up Squidoo which he later sold to Hubpages. He’s been writing marketing books since 1995 and all his work seems more relevant today than ever. 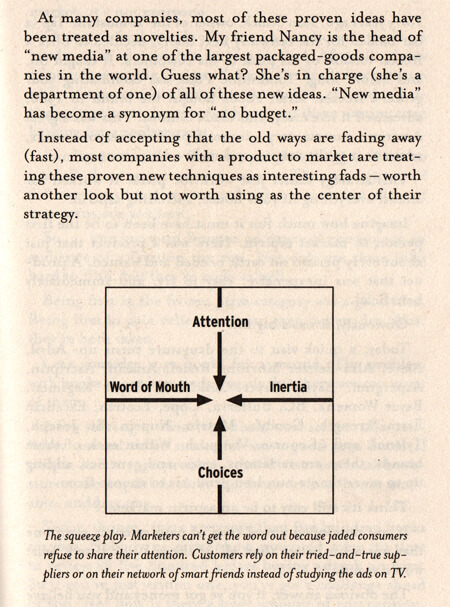 Remember, this is a book that was written before social media existed, although weblogs (as they were called back in the day) sowed the seeds for Web 2.0. Most of what Godin predicts seems to ring true. Although I don’t agree with EVERYTHING he says, I can honestly say this book has aged well and mostly hits the mark. Seth is well known for using abstract analogies to illustrate modern marketing concepts. His central message is about leading and connecting people and ideas. So what the hell is a purple cow? “When my family and I were driving through FRance a few years ago, we were enchanted by the hundreds of storybook cows grazing on picturesque pastures right next to the highway. For dozens of kilometers, we all gazed out the window, marveling about how beautiful everything was. 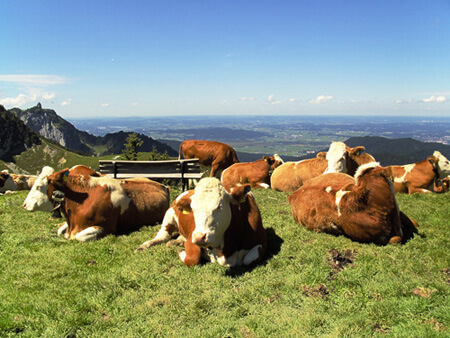 Cows, after you’ve seen them for a while, are boring. They may be perfect cows, attractive cows, cows with great personalities, cows lit by beautiful light, but they’re still cows. The next page mentions how being remarkable is simply a thing people will make a remark about. This isn’t always about soliciting positive comments (more on that later), but getting people to acknowledge ideas that aren’t completely invisible. The book provides a set up for the continued analysis of what Seth refers to as the TV-industrial complex and post-consumption consumers. Every few pages feature graphs, illustrations and statistics. The book didn’t take all that long to read. I read for 30 minutes every morning for a week and was disappointed how short it was. That’s okay, because there is plenty more Seth Godin material online. I write this in 2015 having finished reading the book for the first time. I agree with the opening pages urging us to consider how increasing product choices versus decreasing attention span is threatening the “TV industrial complex” more than ever. To borrow Seth’s analogies: switch on the television and in between programmed content we must tolerate hundreds of pastures of boring cows. Not one of them is purple. 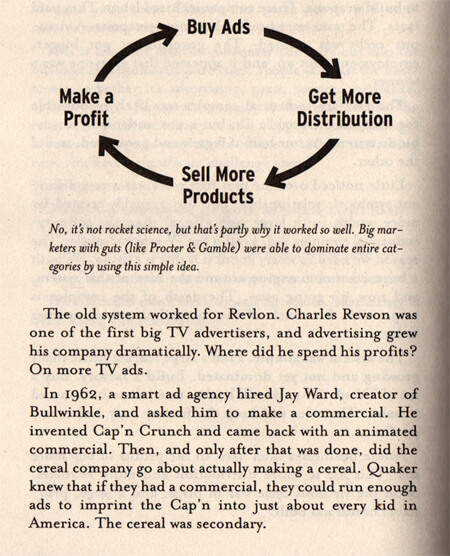 This approach to advertising came from the post war economic boom. The mass consumer age developed a symbiotic relationship with broadcast mediums including papers, magazines, TV and billboards. Television ads occasionally hit the spot but often you will learn about a new product by word of mouth and make your discovery through association with like minded individuals. Internet forums and social media are a great example for the way modern ideas have spread. Ads have now been transplanted on to most YouTube videos. These are much more targeted because contextual internet cookies play a huge part. Maybe it’s the approach to TV advertising that has always failed rather than the medium itself. Do you believe what you see on TV? Do you even care? Do you actually switch on the TV? My position on all of this is that IF you’re going to spend a shed-load of money on ads, you’d better be drawing attention to something that is genuinely remarkable. Otherwise you’re just shining shoes. If the product is exceptionally good for a specific audience who care enough to spread it, the marketing has already happened. Godin refers to this as “sneezing”. I see his point. And I can see how TV doesn’t factor into a genuinely contagious idea. 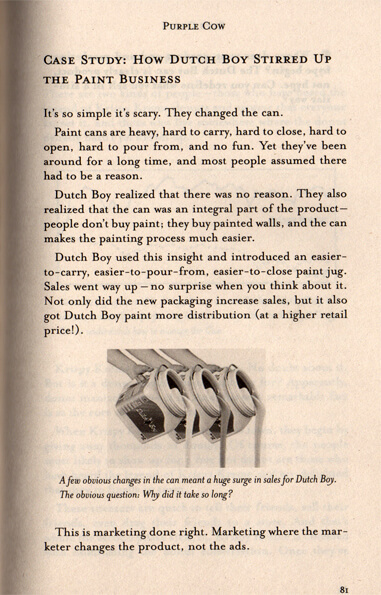 The extract below is about product/packaging design for a paint can. The creators of the paint can obviously collected the right anthropometric data to design the packaging. I studied graphic design in 2003 and the approach we were taught was to look for a product marketing angle and bring this to life through our designs. The problem is, trying to find something interesting about a bland idea is hard. Giving a dog a good name just because you’re being paid to do is a big responsibility. You might as well be a shoe shiner. A TV show that springs to mind from reading Purple Cow is the AMC series Mad Men. Have you heard of it? It’s a drama set in the 1960’s culture of an advertising agency called Sterling Cooper Draper Pryce. 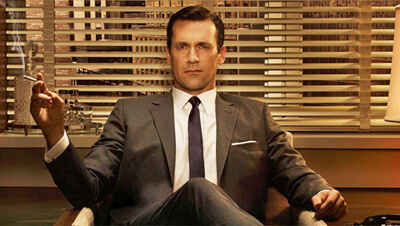 We witness the trials and tribulations of one Don Draper, the founding partner and creative director of the firm. It has echoes of The Wire. Throughout the series, Draper and his cohorts work with high profile brands, deploying every trick in the book to sell average products to average consumers. The first episode sees stressed executives pitching copywriting straplines to a cigarette brand hoping to quash rumours that smoking could be dangerous. Of course, this was the 60’s and tobacco companies had freedom in advertising besides freedom from medical facts. We understand a bit more today! It’s interesting to watch unabashed advertising men gleefully devise the manipulation of consumers while crushing competitors, but that approach to advertising is exhausting for everyone – especially the consumer. Today, the consumer is empowered by the easy access to information online so most enlightened people will not tolerate the fiction in advertising. 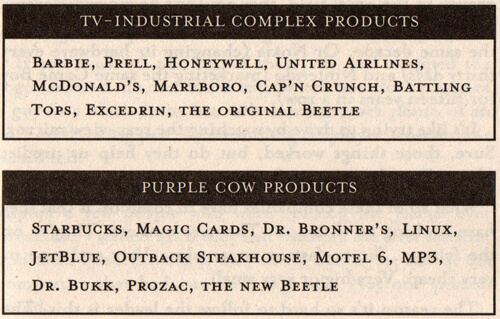 The only “Purple Cow” I’ve ever heard of in the tobacco industry is a brand from the 90’s called “Death Cigarettes”. 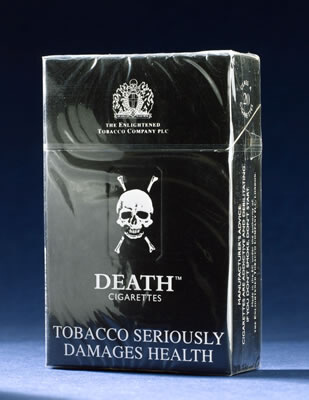 Death was not a product innovation though – these were just regular cigarettes worth remarking on. It was daring branding at best yet they had some success without a mass marketing budget. 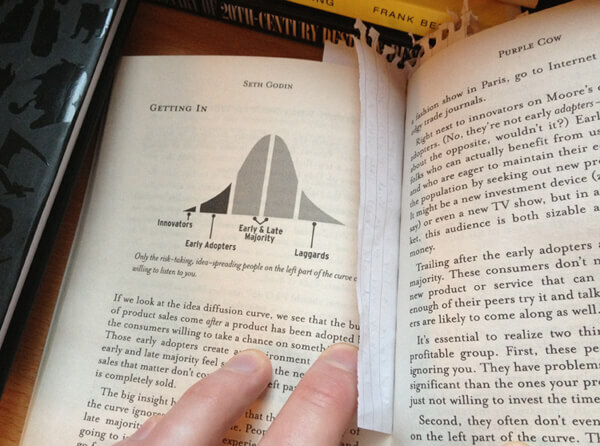 Other ideas discussed include something called the diffusion curve popularised in Crossing the Chasm by Geoff Moore. It is a business theory illustrating how products or ideas affect the population of any given consumer market over time. The curve is often referred to as a bell curve because the line on the graph forms a shape resembling a bell. It resembles a camel’s hump. At its highest peak, the graph represents the general mass market and the greatest amount of people the business has affected. When a successful word of mouth business begins its life cycle, the product awareness is low and usually restricted to a small group of innovators, beta testers and evangelists. As the idea travels along the horizontal X axis it encounters different groups of people until it finally reaches the general population. In the downward trajectory of the curve (the far right side of the graph) the laggards finally take the plunge but miss the benefits because they’re too late. In almost every market the boring slots are filled. Why would you want to launch a “me too” product when you’re only going to end up facing off with an established competitor with muscle and money? A product that is willing to annoy, offend or disrupt will spread among a peer group if it’s catchy enough. I remember listening to a Social Triggers podcast about a sushi restaurant in New York that doesn’t have a menu. If you ask to see the menu, you are asked to leave! The sushi chef wears an apron that simply says “Trust Me”. So, while being provocative isn’t for everyone, it CAN work. It isn’t appropriate for every market. The entire book has the running theme of the fear of failure. This comes up in all of Godin’s books. New ideas are always going to meet opposition. Creativity always comes up against resistance.. 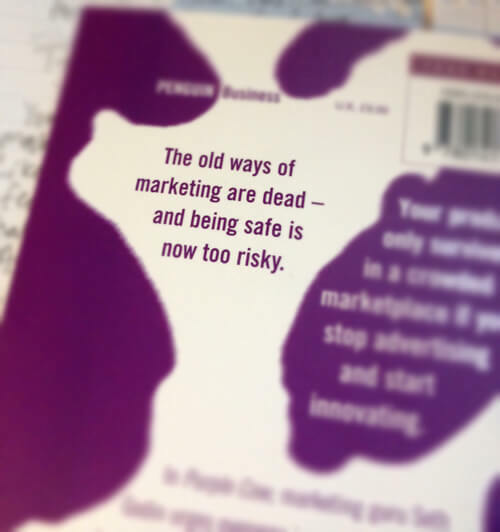 Your boss or coworkers are likely to resist leftfield marketing ideas wherever risk is a possibility. But if you ARE the boss there’s nothing to stop you experimenting. I’ve experienced first hand the fearful attitude of maintaining the status quo. The effort individuals will go to in order to preserve their outlook is nothing short of delusional. I once worked for a local company ran by people entrenched in a stone wall attitude that frustrated me no end. This firm folded in 2016. There wasn’t exactly a lack of ideas, but a fearful group of managers not willing to move with the times and develop a marketing strategy. I wish Gordon Ramsay or Alex Polizzi could have paid the company a visit. It’s understandable that business owners and managers do not want to stand out or take risks: sticking your head over the top of the trench increases the risk of getting shot. But throwing good money behind bad campaigns while sitting on your hands is one way to hemorrhage a small business and kill all enthusiasm. For the sake of surviving in an overcrowded world, let’s learn to get noticed for the right reasons because the game is always changing. Do something useful, different or worth talking about and the phone is much more likely to ring.